Rent ceiling decorations for your Chicago wedding. 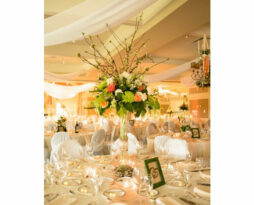 Ceiling decorations are used to soften your event space and to elevate your rooms look. Rent paper Chinese lanterns for a great space filler. Ivory cream sheer ceiling drape added to your event space really illustrates a three-dimensional accent that is used to soften the space. 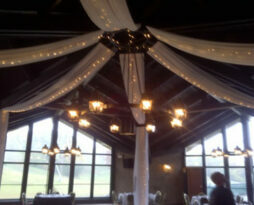 Ceiling drape rentals can be hung in your event space to achieve a classic or modern look. Infusing color hung mid-air is a great way to really customize your event space. Common ceiling panels are white and ivory. Sheer ceiling drape rentals are very common for use in wedding receptions, corporate functions, fund raisers, weddings, benefits, galas, product introductions, and for any event where making a full room filled impact is the intended result. 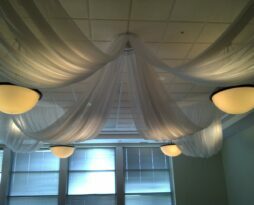 Ceiling drape added to your event space really illustrates a three-dimensional accent that is used to soften the space. Ceiling drape rentals can be hung in your event space to achieve a classic or modern look. Infusing color hung mid-air is a great way to really customize your event space. Common ceiling panels are white and ivory. Sheer ceiling drape rentals are very common for use in wedding receptions, corporate functions, fund raisers, weddings, benefits, galas, product introductions, and for any event where making a full room filled impact is the intended result. We have hundreds of colors/styles of drape, we will work with you to identify the proper styles/colors you will need for your special event. 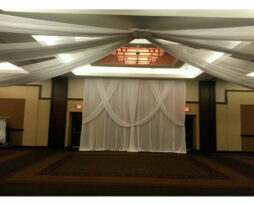 Discounts may be possible on large installations ceiling drape (over 16 panels). Ivory solid (non-sheer) ceiling drape added to your event space really illustrates a three-dimensional accent that is used to cover your event space. Ceiling drape rentals can be hung in your event space to achieve a classic or modern look. Infusing color hung mid-air is a great way to really customize your event space. Common ivory solid (non-sheer) ceiling panels are white and ivory. Solid ceiling drape rentals are very common for use in wedding receptions, corporate functions, fund raisers, weddings, benefits, galas, product introductions, and for any event where making a full room filled impact is the intended result. We have hundreds of colors/styles of drape, we will work with you to identify the proper styles/colors you will need for your special event. 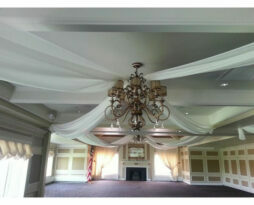 Discounts may be possible on large installations ceiling drape (over 16 panels). Call us in either case to obtain a custom quote based on fabric availability. White solid (non-sheer) ceiling drape added to your event space really illustrates a three-dimensional accent that is used to cover your event space. Ceiling drape rentals can be hung in your event space to achieve a classic or modern look. Infusing color hung mid-air is a great way to really customize your event space. Common solid (non-sheer) ceiling panels are white and ivory. Solid ceiling drape rentals are very common for use in wedding receptions, corporate functions, fund raisers, weddings, benefits, galas, product introductions, and for any event where making a full room filled impact is the intended result. We can add string lighting (Christmas lights) to your ceiling drape. The price listed is a per foot rental price. Lighting added to your ceiling drape gives the fabric and entirely different look and feel. Some say the look is festive, some say fairy tale. In either case it adds a night time dimension to the room that is undeniable. Our string lighting wire is white in color. Sheer ceiling drape rentals are very common for use in wedding receptions, corporate functions, fund raisers, weddings, benefits, galas, product introductions, and for any event where making a full room filled impact is the intended result. To calculate what quantity of lighting you need, add the total length of the ceiling drape panes that you ordered and multiply it by two. 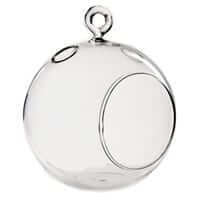 That is the minimum required length of string lighting. EP will install a double strand on each panel so you will have a minimum of two strings of lights on each panel. One traveling down the panel and then one back to the center of the drape. As an example, four twenty foot panels need a minimum of 160 feet of string lighting (4 panels times 20 feet in length times 2 strings per panel). Bling up your event space by creating a unique experience by adding in crystal spiral chandaliers for your Chicago special event. 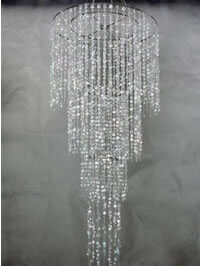 This crystal spiral chandelier rental can be hung in your event space to achieve a great look. Infusing color hung mid-air with crystals disseminating colored light is a great way to really customize your event space. The LED lighting that comes with the fixture really makes it pop for evening functions. This crystal spiral chandelier rental is very common for use in corporate functions, fund raisers, weddings, wedding receptions, benefits, galas, product introductions, and for any event where making a lighted impact is the intended result. Bling up your event space by creating a unique experience by adding in crystal spirals to your Chicago special event. 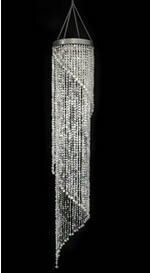 This crystal column rental can be hung in your event space to achieve a great look. Infusing color hung mid-air with crystals disseminating colored light is a great way to really customize your event space. 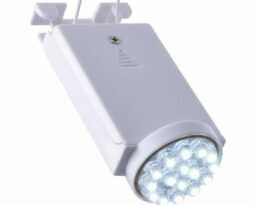 The LED lighting that comes with the fixture really makes it pop for evening functions. This crystal column rental is very common for use in corporate functions, fund raisers, weddings, wedding receptions, benefits, galas, product introductions, and for any event where making a lighted impact is the intended result. Bling up your event space by creating a unique experience by adding in crystal straight line chandeliers for your Chicago special event. 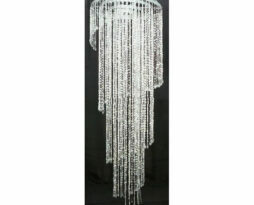 This crystal chandelier rental can be hung in your event space to achieve a great look. Infusing color hung mid-air with crystals disseminating colored light is a great way to really customize your event space. The LED lighting placed at the foot of the column really makes it pop for evening functions. This crystal column rental is commonly used in corporate functions, fund raisers, weddings, wedding receptions, benefits, galas, product introductions, and for any event where making a lighted impact is the intended result. Add in a dimension to your event space by creating a filled closed in experience by adding in paper lanterns for your Chicago special event. This wireless light LED can be added to any paper lantern (Chinese lantern) and can be hung in your event space to achieve a great look. Infusing color hung mid-air is a great way to really customize your event space. Adding LED lighting inside the lantern really makes it pop for evening functions. This paper lantern LED light rental is very common for use in corporate functions, fund raisers, weddings, benefits, galas, product introductions, and for any event where making a modern impact is the intended result. Add in a dimension to your event space by creating a filled closed in experience by adding in paper lanterns for your Chicago special event. 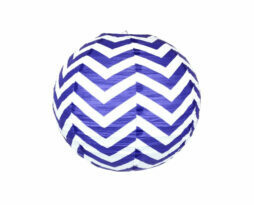 This 6 inch diameter paper lantern (Chinese lantern) can be hung in your event space to achieve a great look. Infusing color hung mid-air is a great way to really customize your event space. This paper lantern rental is very common for use in corporate functions, fund raisers, weddings, benefits, galas, product introductions, and for any event where making a modern impact is the intended result. We have hundreds of colors/styles of lanterns, we will work with you to identify the proper styles/colors you will need for your special event. Discounts may be possible on large installations of 100+ lanterns. Add in a dimension to your event space by creating a filled closed in experience by adding in paper lanterns for your Chicago special event. 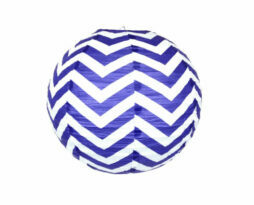 This 8 eight inch diameter paper lantern (Chinese lantern) can be hung in your event space to achieve a great look. Infusing color hung mid-air is a great way to really customize your event space. This paper lantern rental is very common for use in corporate functions, fund raisers, weddings, benefits, galas, product introductions, and for any event where making a modern impact is the intended result.